Siteco Infomatica, in collaboration with the Engineering Department of the University of Messina, carried out the high-precision survey for the technical and economic feasibility planning of the first tramway (red line) in Bologna (IT). The realization of the project, born from a European tender issued last July, required technical verification of feasibility which the team successfully performed with the implementation of the Mobile Mapping System Road-Scanner4. The planned railway route will develop for about 15 kilometers with two terminus stations: the first northeast of the city near FICO Eataly World, the well-known Italian agricultural-food park of the national farming tradition, and the second one, northwest, in the Borgo Panigale area, beyond the Ducati headquarters. The tram route also includes stops in the historical center. Approximately 30 km of roads have been surveyed with the Road-Scanner4. The systems was quipped with a spherical Ladybug5 camera, 2 FARO S70 laser scanners, a LANDINS IXSEA inertial system, and a DMI odometer. The collected data were then processed with the Road-SIT Survey plugin in the AutoCAD environment. This allowed displaying the point clouds on the imagery, carrying out the feature extraction and adding the required measurements quickly and efficiently. All objects can also be displayed in 3D format (sidewalks, walls, poles, etc. ), thus enabling a realistic and comprehensive overview. The survey covered sidewalks, road sections for disabled people, buildings and fences, public lighting poles, electric poles, and traffic lights. Augusto Burchi, Siteco’s technical & sales director said he is satisfied from a technical point of view, but also indicated to be happy that Siteco had the opportunity to contribute to this project which demonstrates Bologna's ability to renew itself exploiting new technologies, while retaining its profile as a great historical city. Mobile mapping imagery of Porta San Felice, Bologna, Italy. Why abandon well-worn mapping methods in current use? It has to be for one or more forms of gain: time, money or staffpower. 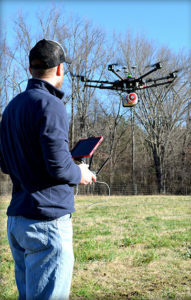 UAV-borne lidar can save a lot of field time, eliminate the need for site revisits, capture more data than previously possible, and provide a better product using more automated extraction tools. Surveyors and other mappers must frequently develop a reliable surface model of an area about to undergo major construction. If it is new construction over native soil, then the area is often covered with vegetation ranging from short grass to very tall trees. By far the majority of these areas are surveyed using GPS, total stations, levels or some combination thereof, depending on the project. In any case, at least one trained individual, more often two or even three individuals, must walk the area collecting the necessary data with some form of survey equipment. This is the tried-and-true methodology. It is easy to schedule, easy to estimate, and barring any field or office mistakes, absolutely reliable. Manually visiting a point in the field on return visits should yield similar, though not exact, results, at least within the tolerances of the equipment. It doesn’t matter if the temperatures are near freezing or over 100 degrees. It doesn’t matter if it is raining or sunny. It doesn’t matter if the grass is cut or if the leaves are on and in full glory. This is a very reliable method in all respects, assuming the proper tools and techniques are used. How can this type of field survey be improved upon? First, is the product sufficient? Does the field crew reliably capture all the pertinent features? Did they get the location of the trees, buildings, poles and so on? How many site visits are usually required to complete the average project? What about the elevation data? Did they capture the drainage and breaklines sufficiently? As always, the driving question is: Why change? Why abandon well-worn methods in current use? It has to be for one or more forms of gain: time, money or manpower — which often equates to one or both of the first two terms. When surveying with conventional equipment such as total stations, levels, and even GPS equipment, the likelihood of failure of a tried and true system is not very great. Comparatively, when using a UAV lidar system, not only are the stakes higher (as the equipment costs more), but the likelihood of an all-out failure is more likely and is definitely more devastating. There is no quick fix if your UAV crashes. It is more likely that the UAV will crash (usually due to operator error) than the lidar system itself will fail. Facing these concerns, does one embrace a UAV lidar solution or hold to the tried and true? If it is important to get a heavily wooded 40- to 100-acre job collected and delivered as a surface at 1-foot contour accuracy (or maybe even 0.5 foot) in a single day, then UAV lidar is the tool for the job. UAV lidar can save a lot of field time, eliminate the need for site revisits, capture more data than previously possible, and allow for a better product using more automated extraction tools. Accuracy. 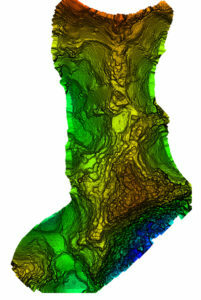 Often the client wants a 3D point cloud, or digital elevation model (DEM), which is not necessarily derived from lidar. If the site has no vegetation present, then an image-based solution should be sufficient. However, most sites are initially covered with vegetation. In that case, an image solution from some sort of aerial camera will only provide a surface on the top of the vegetation — not what the client wants. While lidar may not be perfect, it can get to within 0.1 to 0.2 feet of the ground surface, in spite of grass or trees. For most initial design surveys, this is all that is required. Money. Cost is perhaps the topic of greatest persuasion against lidar and in favor of an image-only solution. A lidar system is more expensive than most camera systems, but again the camera system simply cannot collect viable ground data in vegetated areas. Time. Another factor is the time required to become profitable with the system, and the longevity of the system. In a good economy, it doesn’t take many 40-acre topo jobs to completely pay for a UAV lidar system. Once more, it is about time. As to product longevity, any new UAV product released today should be just as functional in five years. You may have to upgrade your UAV, but the lidar system will still be good for the jobs we’re discussing. Lidar collects XYZ and intensity. It does not collect RGB values. This is a strike against lidar. While lidar data can be colorized with imagery captured from a camera on the same system as the lidar, or separately, this is generally discounted as being imprecise (not well aligned). 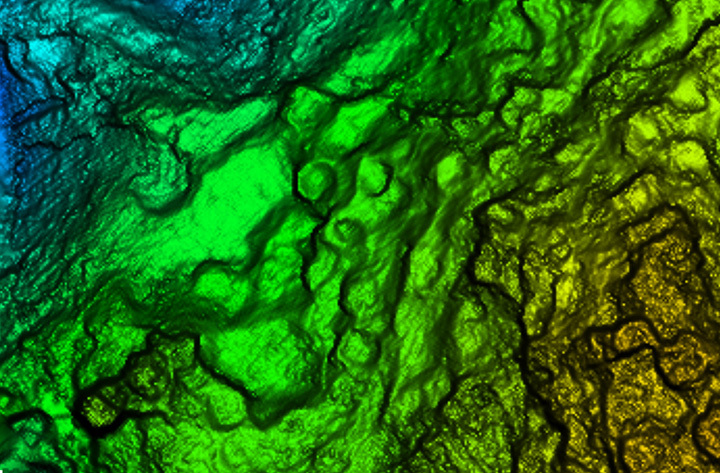 Lidar does not inherently or directly capture color. However, imagery is 2D in nature and does not capture XYZ data. Imagery can align with the lidar nearly perfectly; it is a matter of a good boresight. UAV photogrammetry, or image-only solutions are amazing. They provide a wealth of information. They are complementary to and synergistic with UAV lidar. generally a much wider collection width and fewer flight lines. Further, lidar can often penetrate dust, fog and mists. 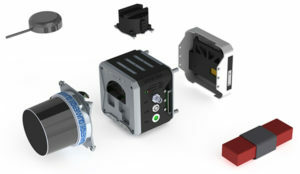 Lidar does require an inertial navigation system (INS) and all of the controlling software. This generally makes the system more expensive. It also makes it able to more rapidly generate the final product. Inertial Use with Lidar. An INS combines a GNSS receiver with an inertial measurement unit (IMU) and a lot of software and specialized filtering algorithms. It is essentially the central nervous system of a lidar system. The GNSS receiver provides universal timing such that every instrument including the IMU, scanner, cameras and others are all precisely time-stamped. This is key to proper data fusion. The GNSS receiver also provides positioning. The IMU is essential for determining proper orientation (roll, pitch, heading) as well as positioning at an extremely high data rate (2000 Hz) between the recorded GNSS epochs. If a GNSS event is missed (which shouldn’t happen on a UAV) the IMU bridges the gap between epochs. Large gaps can lead to positional drift, but shouldn’t happen on a UAV. The real-time software maintains satellite lock (coupling with the IMU as necessary), while the post-processing software, using a post-process kinematic (PPK) process, provides the best possible solution of the trajectory. It solves the trajectory forward, backward and over and over with different parameters until it reaches an optimum solution. So it’s not just the hardware that makes the system more expensive, it’s also the software. Double Duty? There is some confusion as to the INS on a UAV. Can the INS used to navigate the drone be used for the lidar system as well, to save money? Yes, and no. Yes it can, with the proper integration — however, the INS to navigate the drone is usually far, far inferior to that required by a lidar system. So, No. Also, the lidar system really should be portable from the UAV to a car to maximize use. So the systems need to remain separate, for the most part. Height and Width. Another UAV sensor issue concerning lidar is often very confusing. Some sensors are only good for 40- to 60-meter flying heights; some are useful to 200 or more meters. Depending upon where you work, this may be of no concern. In the U.S., we are limited to 120 meters above ground level (AGL) in any case. In most areas, being able to fly at 80 to 100 meters AGL is sufficient as long as accuracy and point density are not compromised. Scan width varies a lot as well. The scan width of the shorter range systems is typically no more than 150 meters of usable area, whereas others can scan 500 meters wide. Consider that most surveys are 40 acres, maybe up to 100 acres, and we find that one flight is all that is necessary even with the least-expensive system. Do you need 500 meters wide? The answer depends upon your business model. If you are doing miles and miles of transmission corridor work, you probably need the greater width. Ground Accuracy. What matters here is not so much positioning accuracy but point-cloud thickness. This can be difficult to understand and is a worthy subject by itself. The question is whether you can deliver the product you most often are required to deliver with the system. If you deliver 1-foot contour projects, can you achieve this with a 6-centimeter system or do you have to have a much more costly 1-centimeter system? Clearly the 1-centimeter system is much better, but what do you need to deliver? Intensity is another concern. Most of the less expensive systems don’t do a very good job delivering a “b+w image-like” point cloud; that is, their intensity falls off dramatically with distance. Others do an amazing job. Is this important? Can it be overcome with colorization? If you were doing your work conventionally, would you be delivering an image-like surface? I doubt it. Certainly the intensity is nice to have and the information can be very useful in automated processing, but is it worth the price difference? Recently we undertook an adventure with some explorers in South America, near the city of Jaen, Peru. A crew filming a new TV show for the Travel Channel sought to understand more about the ancient civilization of Chachapoyas, Warriors of the Clouds. Little is known about this race of people because they were conquered by the Incas in the 16th century and shortly thereafter by the Spanish conquistadores. Our team was to help identify structures in an area called Leymebamba, about four hours’ drive from Jaen, hidden beneath the deep Amazon cloud forests — definitely not a typical North American forest. These forests are not only very dense with vegetation but with cloud cover that is generally at the level of the canopy. Many centuries after the Chachapoyas have vanished, structural remains are concealed not only by the clouds and the canopy, but buried beneath several feet of dirt and a lot of living and long-since-dead organic matter. Only the most pronounced features can be found by the naked eye or a traditional survey. Lidar brings a huge advantage in that it can get a much better approximation of the ground as well as any other hard surface such as walls, fences, trails, buildings and towers. By blanketing an area with dozens if not hundreds of points per square meter, post-processing software can “peel” the living vegetation away from the ground surface. This ground-classified data can then be analyzed by a trained scientist to determine if there are in fact any revelations to be had. In our case, we were using an A-series high-definition lidar system, best flown at 40 to 60 meters and, in extremely dense vegetation, at 5 to 6 meters/second. Collecting 700,000 points per second enables us to potentially capture more than 400 points per square meter in a single pass. The area we were to scan varied considerably in terrain and had very little to offer that was flat and open. 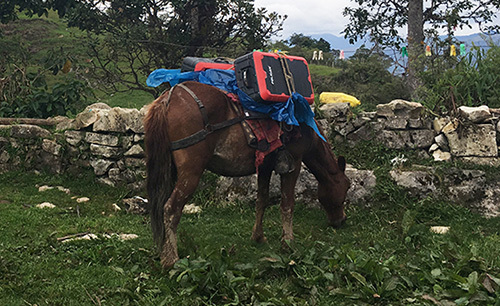 In fact, to get to the site, we had to pack several mountain horses with the UAV, several sets of batteries, and the scanner as they traveled down very steep terrain about 900 feet to the base of the hill to be scanned. We’ve said we can scan from nearly anything moving, but we’ve never done it from a horse. Well, we weren’t actually scanning, but it was pretty close. Finding a suitable take-off and landing area posed a challenge. Due to vegetation and terrain, only small areas could be scanned in a single flight, as the vehicle would quickly leave line-of-sight (LOS). While LOS may not be an issue legally in this area, it remains a real concern: we always want our equipment to come home at the end of the mission. We learned something we hadn’t anticipated along this journey regarding weather. The day would start out around 80° F; around 2 p.m. it would rain, and the rest of the day would close out much cooler. Does this matter? Yes, if you are now wet and cold with several hours ahead of you. It seems there is always some new surprise. As the area was remote, with no internet access, the existing map data for mission planning had to be downloaded prior to visiting the site. Each lidar mission was preceded by a scout flight using a small UAV to help ensure safety and appropriate flying height per flight line. Situating the Base. Projects like this always pose dilemmas. Finding a good place for a GPS base station in a cloud forest is no small task. Normally we would put the base station on a known reference point so we can easily join the data with other projects. In this case we didn’t have any such concern. We simply needed an area with a clear view of the sky; usually this means no obstructions 12 degrees above the horizon. However, in a forest and in the mountains, you take what you can get. In our case, we found a rock outcropping and placed the unit on it with no tripod. It didn’t give us the best solution, but it worked. Ideally we leave the base running for hours to get a good solution. Since we had multiple sites to scan, this wasn’t a problem. All sites were within walking distance of the base, so there was no concern about being too far away and adding more problems to the project. In PPK mode we can easily be 10 or 20 kilometers from the base with no concern. Other Forest Challenges. In-field processing, far from internet or electrical supply, requires very judicious battery and especially laptop usage. The lack of many things we take for granted can quickly be a show-stopper if necessary (maybe even a phone call). Even back at the hotel where power was available ­­— don’t count on it. While the film crew and archeologists are eager to see results, everybody has to wait. No power. Supposedly this is common and only lasts an hour. Three hours pass and everybody goes to bed but the lidar crew. Finding the ground should be easy, but a new version of software has been installed. There’s a kink in our plans. Finally after some internet help (a call back home), the right settings are found and the software begins peeling away the vegetation to reveal the ground. The top of each hill (several were scanned) looked like a primitive fortress with 20 to 30 cylindrical structures clearly spread over the top of each site. On one site we identified a tower at least 3 meters in height. While areas like this could be scanned with a conventional aerial system, collecting much larger areas, the UAV lidar solution offers several distinct advantages. One of these is just a quick recon of the area. Physically being on the ground at the site makes the team much more aware of what is going on. Secondly is the far, far greater density of points and the ability to collect much more off-nadir, allowing for more of the vertical structure to be captured. In the end, our mission was successful. The UAVs were ported by horseback up and down precarious trails. The lidar worked great. None of the batteries failed. The drones didn’t crash. The archeologists were thrilled with the results, having found several new structures and a tower unknown to them. 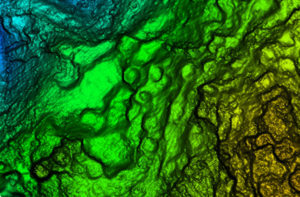 Once again, UAV lidar proved to be the best tool for the job. Indiana Jones out! As both INS sensors and lidar scanners continue to change, this allows us to make quite a variety of configurable systems. For this particular project, we used our Snoopy INS (OEM) with a Quanergy M8 Ultra scanner. The Snoopy INS uses a NovAtelOEM719 GNSS receiver to ensure best performance with GNSS collection. Other options for the INS include the NovAtel STIM300 (Sensonor IMU), VectorNav VN-300 and Trimble Applanix AP family. For scanners we support all Velodyne scanners including the latest AlphaPuck, Quanergy, Riegl and several more. Of course, for cameras there are the ever-popular FLIR, Sentera, PhaseOne and DJI. GPS base stations are not all equal, but most will work as long as they log at least L1/L2 GPS at 1Hz. JEFF FAGERMAN is a a professional surveyor and certified photogrammetrist. He has a master’s degree in photogrammetry from Purdue University and worked as a photogrammetric software developer at Intergraph before starting Fagerman Technologies. 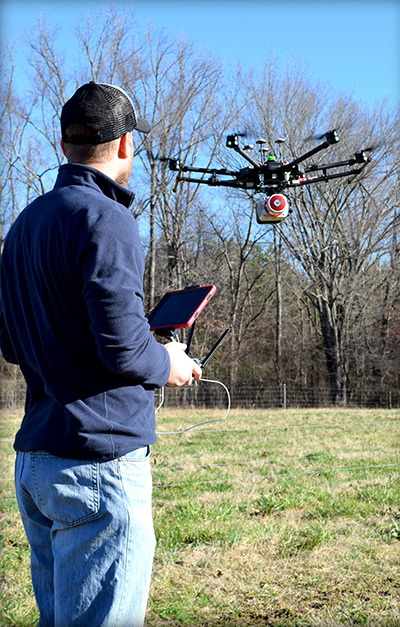 Now known as Lidar USA, the company focuses on mobile lidar aboard UAVs. Cover image by Bailie McRae. Chinese company Forward X Robotics showed off its Ovis luggage at the 2019 Consumer Electronics Show. Ovis uses cameras for facial recognition and a movement tracking algorithm to lock in on its owner and stick with her or him at a speed of six miles per hour. Ovis is able to avoid collisions as it makes its way through crowds, according to its maker, which is now producing the suitcase after an IndieGoGo campaign. The Ovis suitcase comes with a smart wristband that sounds and vibrates if the case gets more than six feet away. Its embedded GPS provides real-time monitoring and tracking via smartphone; the location tracker is in an uncuttable luggage tag. Similar following suitcases include 90Fun’s Puppy 1, which uses remote control to follow, and the Travelmate Robotics, which provides a removable GPS chip to enable tracking of the bag or anything else of value. Global GNSS , una subsidiaria de Polosoft Technologies, ha lanzado una nueva aplicación móvil llamada GNSS Surveyor , que está diseñada para la industria geoespacial. La aplicación GNSS Surveyor proporciona información de ubicación y datos de posición de calidad en tiempo real con una precisión de metro a centímetro. Debe estar conectado a cualquier receptor GNSS externo a través de Bluetooth. Un comando configurado de un solo toque para comunicarse directamente con el dispositivo Bluetooth GNSS. Información de ubicación y calidad de los datos de posición en tiempo real con una precisión centimétrica. Datos de GPS como posición, altura, satélites y velocidad. Información de constelaciones para satélites GPS, GLONASS, Galileo, BeiDou, QZSS y SBAS en la órbita. Función IP directa para datos de correcciones RTK. Conversión DMS a DD o viceversa. Los datos de corrección cinemática en tiempo real (RTK) se pueden reenviar a un dispositivo externo de alta precisión. El cliente NTRIP interno carga los datos RTCM de Internet. Con GNSS Surveyor, la información de ubicación se recopila como latitud y longitud, altitud, velocidad o ritmo, demora y tiempo UTC. La precisión de GNSS incluye cobertura global, precisión de nivel centimétrico, tiempo rápido para la primera reparación, constelación múltiple y multibanda, y máxima seguridad, dijo la compañía. Los usos de navegación incluyen la navegación robótica terrestre, la navegación a nivel de carril, la navegación con máquinas pesadas, la navegación y el rastreo industrial y el UAV comercial. GNSS Surveyor se puede descargar desde la tienda de aplicaciones . GNSS Receivers – Evolution or Revolution?